The peacock network has decided that they can’t stomach more than one season of newbie reality series America’s Next Great Restaurant. There won’t be a second season. The show premiered on Sunday, March 6th to a very underwhelming 1.6 rating in the 18-49 demographic and 4.59 million total viewers. As bad as that was, the second installment did even worse, dropping 13% in the demo. Week three fell another 14%, falling to a 1.2 rating and 3.77 million. The ratings story for America’s Next Great Restaurant got even worse as the season progressed. It hit a season low in early April with a 1.2 demo rating and 3.51 million. The finale bumped back up to a 1.6 rating and 4.41 million viewers but that was hardly enough to save the series. Though NBC billed it as the season finale, it was clear that the show was over. 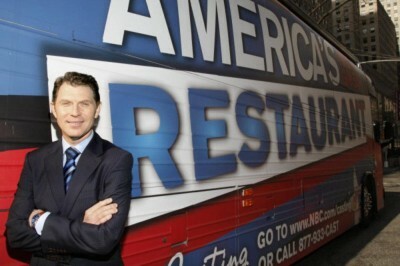 NBC has now made it official and cancelled America’s Next Great Restaurant after nine episodes. What do you think? Are you sorry there won’t be a second season of the series? Was it a better show than the ratings indicated? More about: America's Next Great Restaurant, America's Next Great Restaurant: canceled or renewed? Americas Next Great Restaurant was one of the best shows that NBC has shown. I’ll miss the show greatly. I loved it, as well did my friends. We were really looking forward to season two. I really enjoyed the show, not least because it wasn’t more cookie-cutter crap. It was a unique and entertaining show. Not everyone wants a 42nd spinoff of NCIS, CSI Des Moines, or yet another island/house full of “reality” morons. American tv needs more (as in even one) new ideas. THIS SHOW WAS AMAZING! It was so intrestinf and i loved watching it! so sad to see it go!